It's been how long since the last photo page? Yeah, I know... but as the kids get older, it's harder to get pictures of them. I guess that's just an "existing reality" and we're not the only parents to experience this! For a little change of pace... well, maybe more because I'm being lazy... these photos are in reverse chronological order with the newest at the top of the page. 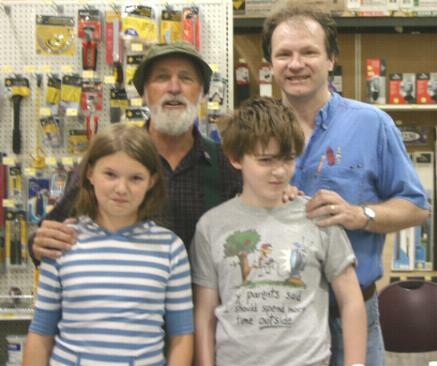 Some of you may know of "The Red Green Show" or recall that the family went to one of the final tapings of the Canadian comedy classic in Toronto in October 2005. Well, Red (aka Steve Smith) is on a "Wit and Wisdom" tour at this writing, fundraising for Public Television stations. 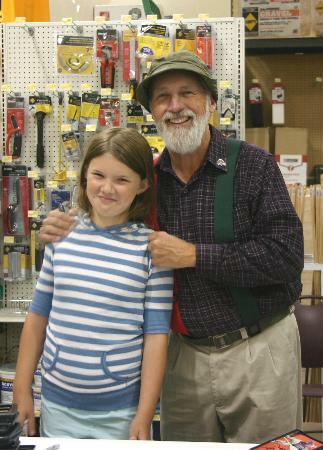 But the tour also includes personal "Meet and Greet" appearances at, well, where else but hardware stores? (Quote Red: "If the women don't find you handsome, they should at least find you handy.") Kieran, Thalia, Red and your webmaster (in a rare photo appearance) pose for the camera in August. Red wanted a photo with just Thalia "since she clearly didn't want to be there". Ah, but she did, and gave a big smile! 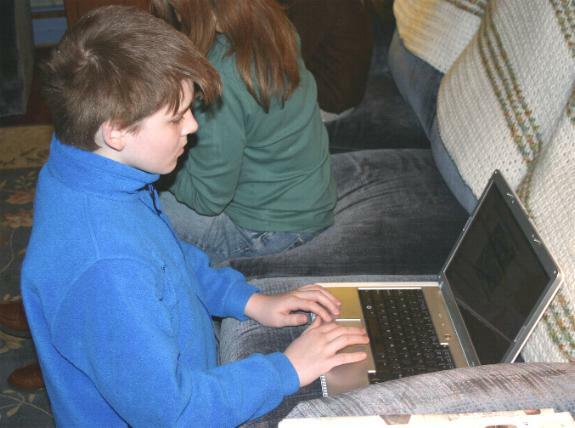 Hamming it up, or perhaps being serious about a computer game, at the kids' grandparents (and my old house) in New Jersey. 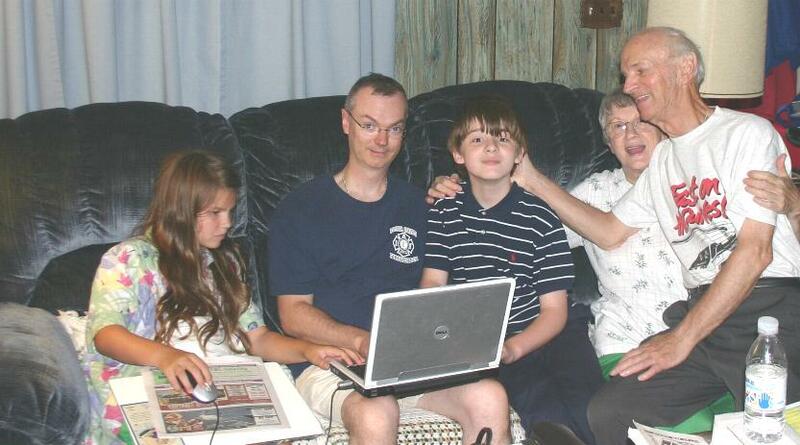 Thalia, their Uncle Stephen, Kieran, and my mom and dad, in what isn't exactly a candid shot, July 2010. Thalia welcomes us to "Butterfly Town USA", July 7. 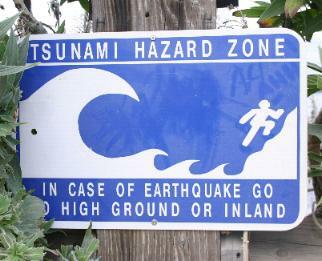 It's just to the west of its better known neighbor Monterey. During our annual California trip to visit family, we spent an overnight in the Monterey Bay area, and for a little variety, branched away from the usual tourist spots like Cannery Row. 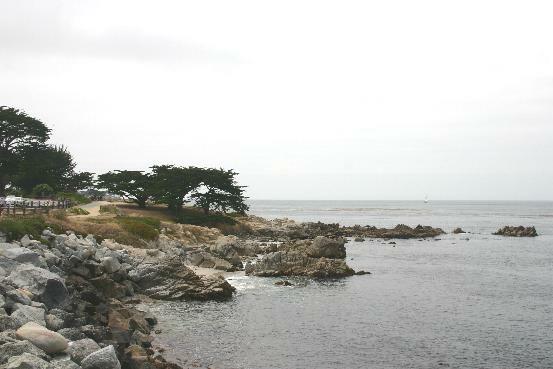 We did not have "Chamber of Commerce" weather at Monterey Bay, as this seaside image illustrates. But we were grateful for the relatively low temperatures we experienced while the East Coast was baking in 100+ degree heat during the same week. Kieran doesn't seem to be having any luck convincing some local "residents" that he's their leader! 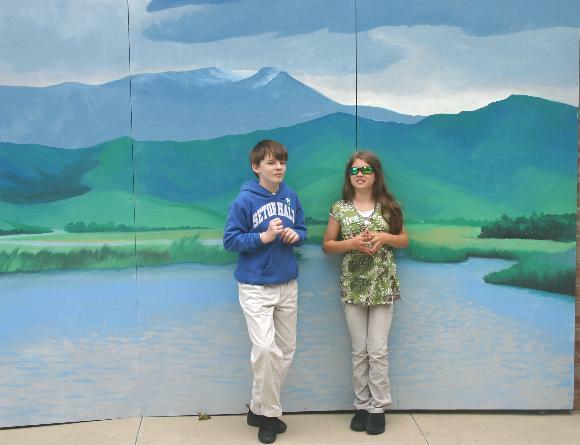 Kieran and Thalia pose in front of a mural on the grounds of the National Steinbeck Center in Salinas. A highly recommended stop for those who appreciate John Steinbeck's legacy, or literature of any kind, for that matter. My favorite work of his, as you might know, is Travels With Charley. 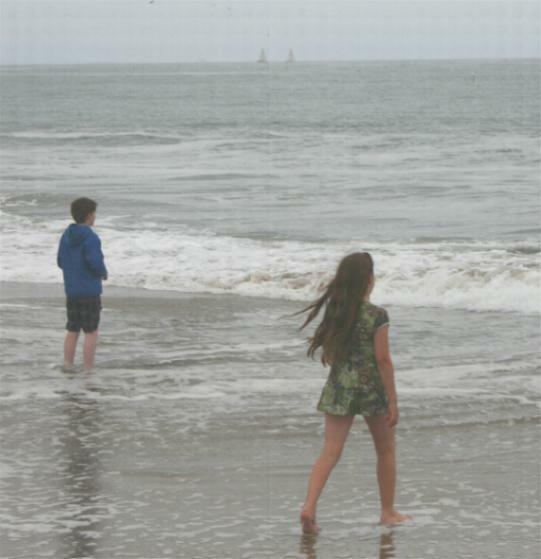 What has become a traditional shot: the kids, and the sea, at Santa Cruz, later the same July 6. I think Steinbeck would approve. (Left) Thalia and Kieran on Independence Day at the exact spot where their mother and father were married not quite nineteen years before. This is the home of one of Rosemary's cousins, in the hills above San Jose. It was a perfect spot for a wedding! 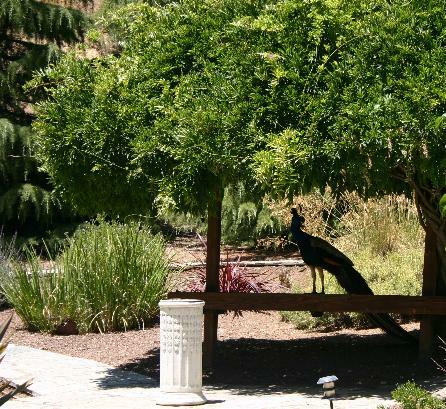 Among the natives of the area around the house are a group of peacocks, which have called the hills their home for more than fifty years. 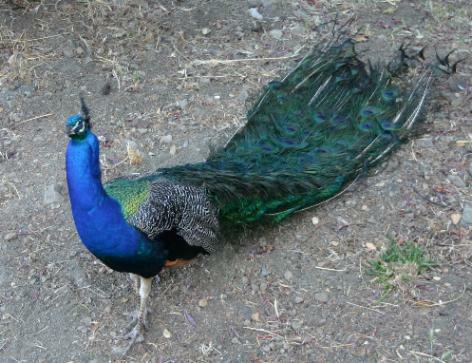 The story goes that they were brought in by a family that missed them in their home country, and while that family has long since gone away from the area, the peacocks remain. 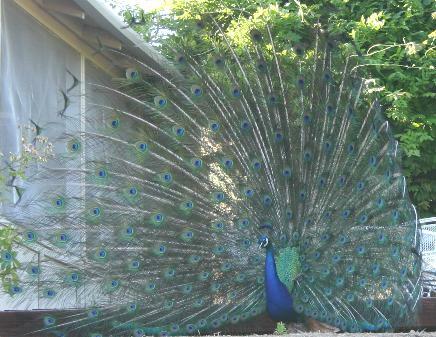 I'm sure that some of this particular bird's predecessors were present at our marriage ceremony, which made it that much more special. Ah, the joys of what we used to call "Home Economics." 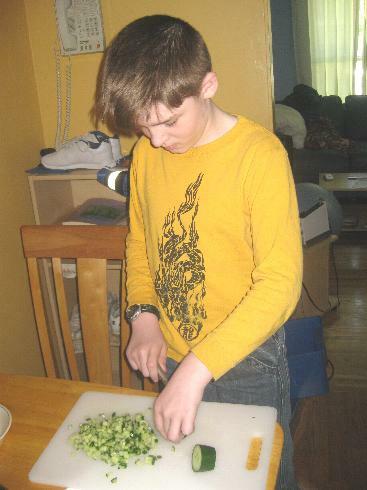 In 7th Grade "Home and Career Skills," Kieran had to prepare a breakfast for the family. In 8th Grade, it's a dinner... from scratch. 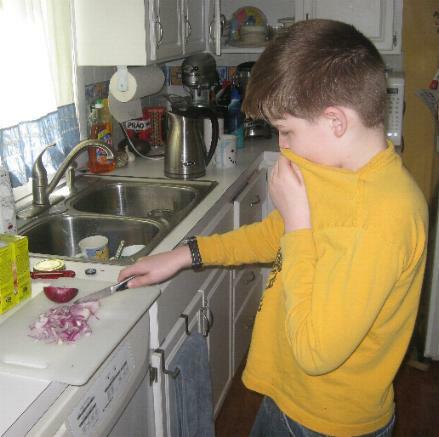 Regardless of your age or grade, onions still have the same effect. Kieran does his best not to "tear up" about it. Cutting a cucumber: Not so bad. Somewhere on that stage at the Lilac Festival, May 20, is Thalia Elizabeth among the rest of the Indian Landing Singers, the group from her elementary school. Many other performers have graced the stage-- among the 2010 guests were Rita Coolidge and Vonda Shepard, who put on great shows-- but I'm most proud of our daughter's appearance. Yeah, I'm biased, any objection? 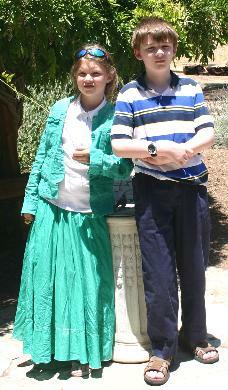 And what did our daughter do for her tenth birthday? She played in a concert! That's her on the harp at the far left (apologies for the quality of the "available light" shot). The school principal announced that Thalia was spending part of her birthday with the band, and everyone applauded. Yes, we did still have a birthday cake after the concert. 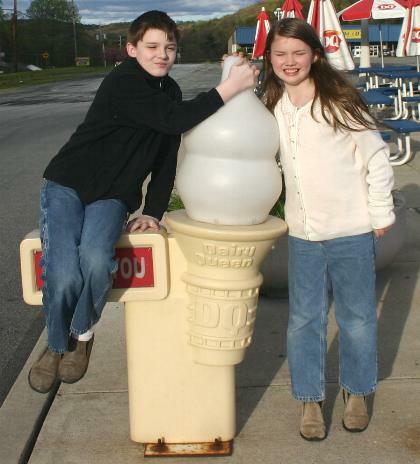 We top things off for this page with an April image of Kieran and Thalia now both taller than the "ice cream cone" at Dairy Queen (this particular one not far from the Delaware Water Gap). We remember when they weren't nearly big enough to touch the top of the "cone". And that's another thing that we parents need to get used to!